Laminate flooring problems range from simple blemishes to serious manufacturing defects. Often these concerns are so similar in appearance that it takes a knowledgeable flooring expert to determine if it is manufacturing, site related or of other cause. Here we describe a number of those concerns. On other pages we talk more in depth about many of these and other types of laminate flooring problems. When the surface layer raises from the print and core layers this results in delamination. Delamination may be seen in the field of the plank as a bubble. Delamination may also be found along an edge. When an area of delamination continues across the seam of the planks this is almost always a site related condition. When the surface layer alone is separating without any signs of moisture or steam related damage, this is often one of those manufacture related laminate flooring problems. Core voids are manufacturer related flooring problems. Core voids are seen as indentations in the face of the laminate floor. The best way to tell a manufacturing core void from a dent caused by a dropped object is the absence of stress cracks. A dropped object usually leaves cracks while a core void does not. You should be able to identify some void still below the laminate face even though the face layer has collapsed into the core. Blisters are small bumps in the finish of the laminate floor. These bumps often look like a pimple and can be very difficult to see during installation. Micro chipping is seen as continuous small chips along the edge of the plank. The chips usually appear white in color.These chips occur during milling of the laminate plank as the result of a dull milling tool. While the consumer may be of the opinion that micro chipping problems should be covered by the manufacture as laminate flooring problems – the manufacturer may only cover micro chipping that is severe enough. Even then they may not cover it if the chipping was so severe that the micro chipping should have been seen and the flooring not installed. Color variations are laminate flooring problems but not necessarily the problem of the manufacturer. Some manufacturers state that there will not be a color difference between runs. When this is stated, a color difference between runs is the laminate manufactures problem. A color difference would be a difference in hue, shade or gloss. At times what appears as a color difference is actually the installation of two different colors of laminate floor. If the carton labels or plank markings show this to be the same style and color this is a manufacture related condition. If the packaging shows that the planks were different styles or colors the manufacturer will unlikely warrant the difference and this laminate flooring problem will be between the consumer and supplier or retailer. Fading warranties differ with each manufacturer. Some laminate flooring manufacturers see fading one of the laminate flooring problems they will cover in their guarantee. Usually the fading will be limited to certain causes such as stating that their floor will not to fade due to sun or electrical lighting. 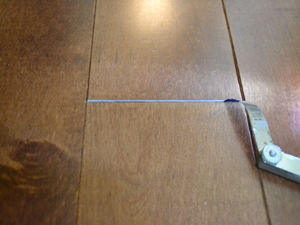 Gaps are among the most frequently seen laminate flooring problems. Gaps may be site related, installation related or manufacturer related. On narrow gaps a feeler gauge or coins can be used to measure the size of the gap. Tolerance is not the same for all manufacturers. Voids or gaps in the glue are manufacturer related and will normally be seen as delamination. 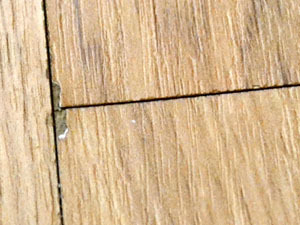 Gaps in the glue will allow moisture to penetrate at the seam resulting in swelling along the plank edges. Can anything be done when edges of laminate is bubbled when a pet urine has not been seen and had dried on the floor and bubbling has occurred? The planks that have bubbled along the edges from pet urine are permanently damaged. These planks are not correctable and the only thing you can do is have the damaged planks replaced. I would like to purchase a dinette set with chairs that have casters. Will it damage the laminate flooring if I replace the wheels with rubber casters? Rubber casters are generally approved for laminate floor as they will usually not create the type of damage you see caused by plastic and metal casters. Since the warranty of all laminate manufacturers and on all laminate floors is not the same you will need to read the warranty information that covers your floor. If you don’t have that information but have the name of the manufacturer and the product you should be able to get a copy of the warranty by performing a Google search or by contacting your dealer. ± year ago installed Jatoba (Thomasville Engrd.Wood) on condo slab (removed carpet) and now have “popping” noises (when walked on) in several areas. How can these “voids” be eliminated? Is this a floating floor, glued floor, nail down? Is the floor installed over wood, particleboard, concrete or other? Did you have wall to wall carpet over the engineered wood or was it a rug you removed? Or are you saying that you removed the carpet and then installed the engineered floor and now have popping sounds? You mention voids. Are these voids between boards or under the boards? You really need to give a lot more information and if you do so I am sure that either a reader of this forum or one of us at the Weinheimer Group will have a suggestion for you. Please comment back with your expanded information. I work as a house keeper and one of my clients has very lovely laminated floors in there new home, They have a matt finish which I had never seen before, there very well installed you can see that a glance. I was called in to work at there home because my client was having problems cleaning them. Cleaning Laminated floors are very easy to do, it usually only takes clean water and a light cleaning solution only to remove scuff marks and dirt brought into the home from the out side and they are as good as new. The problem hear is that these floors do not clean the way there suppose too. You wash them and there seems to be a gray film that covers the floor and when dry they look streaky and the gray film is still there. what to do? You mention that the reason your customer called you is that they were having difficulty cleaning the floor. The description of the problem with the floor drying with a gray film it sounds like the customer was not using the correct product to clean the floor or they may have been over using the correct product. Since not all laminate floors are identical my suggestion to you would be to call the customer service or technical department of the manufacturer that made this specific floor. When you describe the problem they should be able to tell you what you will need to do to clean them. Click on the Manufacturer Help link at this website and you may find your answer. https://laminatefloorproblems.com/category/install-laminate-flooring-manufacturers-installation-instructions/ If you don’t find a contact number here contact us back and we will see that one is added. I have a laminate floor pergo type. Not the wood one, the fake kind that looks like tiles. I had an under sink leak and water made it sort of come up at the edges. Is there a way to make sure it does not come up? so it would lay flat again instead of sort of having edges that look bubbly? Water likely got under the laminate floor where it was absorbed into the core and the printed paper that makes up the design. Unless the bubbles go down on their own and they rarely do, your best bet is to replace the tiles in the damaged area with matching tile. Unfortunately I don’t think you are going to find it in print. We receive the information from Pergo in a form that we are not allowed to share copies of and originally received it a few years ago at one of the many Pergo training courses that Kevin and I have participated in. In recent years I have not seen a repeat of the number of proud edges they consider a problem though we have not been informed by Pergo that it has changed. One thing to remember about proud edges is that the tolerance with Pergo and most all of the laminate manufacturers allows for a pretty good size ledge (not all the same). Some of the manufacturers are now only accepting measurements that are taken on uninstalled planks and this can be a problem if no planks from the original installation are available. If a representative from Pergo see this question and reply please share your knowledge on this issue. Jeff, Now that you have pointed it out, that section of the Laminate Floor Problems website will undergo review to determine if there are any changes. In the meantime, if you have a specific question and would like to share more information with me, feel free to use the contact form. What causes proud edges? Is it a manufacturing issues, an installation issue or a combination? For those that do not know what a ‘proud edge” is when talking about laminate flooring. A proud edges are differences in height at the joint edge of a laminate plank. Proud edges are often manufacturing related but not a manufacturing defect as there are allowable tolerances and these differ per manufacturer. You can also have what appears as a proud edge that is installation or site related such as those caused by an uneven floor, debris or poorly spread cushion below the laminate. We are getting ready to install laminate flooring in our kitchen and dining rooms. I like the look of wood, but thought that laminate would hold up better. I am concerned with water in the kitchen. Is there another wood like product that would be more practical for the kitchen? Shirley, Many people use laminate and wood with good success. If you have an active family and it is going to be difficult for you to keep water off the floor you might want to consider one of the many vinyl plank floors. While I stay away from recommending any one brand you can check them out at your local flooring dealer or a big box store. I read your recommendations and found them very informative. I have laminate flooring installed in my 8th floor condo in Northern Virginia. For 2 years everything was fine. I then experienced buckling at the seams in certain areas. The floor has never been wet. The installer returned and advised I needed moisture barrier. The flooring was glued direct to the concrete. They removed the flooring which had only adhered to a small portion. This occurred and 2 weeks later the floating floor developed high spots again. The installer returned to check for spaces, as required in for all detections. Within 2 weeks the seams lifted again in the same area. I am very happy with the product but am a wits end. There are 240 units in the condo with numerous floors the same as mine, without problems. Guidance, recommendations are requested. I am confident the mgr and installer will run out of patience. I have laminate flooring in my kitchen/dining room/ great room. It is a beautiful floor but I have a problem I haven’t seen discussed. When the humidity is high a moisture like sheen forms on this floor and you can actually see footprints and greasy looking spots on the flooring. I have no problem with any other flooring in my home and have a mositure barrier which I have had checked with no moisture problems found. Can you help? My first suggestion would be for you to make sure you are using the proper cleaning product for your laminate floor. Some products will leave a residue that will give a foggy or blotched appearance. This appearance could change with changes in the relative humidity. If you know who the manufacturer is for the product you have installed you can do a Google for the maintenance instructions for that product. You can also call or email their technical department for assistance. 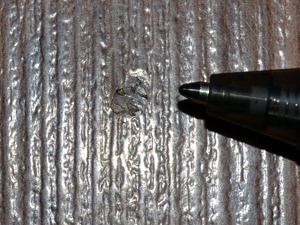 hi…i have scuffs on laminate floor …not scratches….looks like it is just in the clear finish….can u recomend a product to polish/remove them? i dont know the floor manufacturer….can u respond to my email? I know you requested that we respond to you by email. Questions at the Laminate Floor Problems site need to be replied to here so the information can also help others. While laminate flooring has a plastic coating giving it a harder finish than many floors it can lose its appearance from dirt, abrasive soil and scratches resulting in a dull appearance. As far as removing scuff marks from laminate floors I personally have not found a product that I am pleased with. 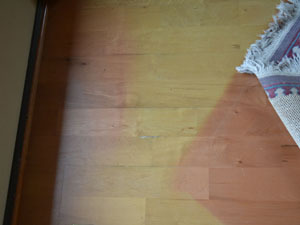 Polishes designed for wood floor seem to make a mess of laminate floor. Laminate floors have floors have a plastic surface so you are polishing plastic and not wood. If any of our readers have had success removing scuffs from laminate flooring please share this information to help others. Some of the scuffs on your laminate floor may actually be the residue of cleaning products you have used and you should be able to clean the residue off. Remember when you use a cleaning product use on the mixture it says on the container. Using too much cleaning product can leave a residue leaving your floor looking smeared and scuffed. Use a dust mop, or vacuum with floor tool to remove loose dirt or grit. Do not use a beater bar as it may damage the floor. There are several Bruce products and not all are approved for laminate. Make sure you are using the correct product. Also make sure you are not using too much of the product. If you are using the correct product contact Bruce and they will give you further instructions. We are going to be replacing our laminate flooring after 20 years. The one we have was “perfectly” installed (glued) but immediately started showing scratches. It looks terrible now. The manufacture’s rep said that it was because of dirt brought in. However, even a dried bread crumb scratched it. I would like to know your thoughts on the most scratch resistant flooring that I could get either a wood look or ceramic tile look. The walls are all rought cut cedar, cabinets are dark walnut, and counters are a formica tan, teal, and green in a marbled look. It all looks great with the oak look laminate if you overlook the scratches. Thanks for your help. Sorry but as inspectors we like to stay neutral when it comes to recommending particular products at this site. Perhaps some of our readers have a suggestion for you. I have layed down my laminate floor on top of my carpet pad, because I read somewhere that it would be alright. I didn’t use glue on the seams though. Bad idea! Now I know. And its too late to turn back. I went to my hardware store and they told me I should use gorilla glue on the seams and caulk for the gaps. Now, my floor looks a little bad, because you can see the tan, yellow glue lines in between the seams. My question is, how can I conceal the glue lines? Rona, you have a real mess on your hands. First of all I hope the carpet pad was a thin, extremely dense cushion for other than that a laminate floor will eventually fail over most carpet cushions. As far as the lines where you used gorilla glue, about the only way you are going to cover these is with a rug. I hate to be the barer of bad news but you are not going to be able to conceal gorilla glue lines. You may reduce their visibility by using a marking pen close in color to the laminate but on the other hand they may end up showing more. Hello, I have problems. My lamiate floor has the cushion attached to the bottom of it. And is installed over subflooring. Plywood I think. We had soot damage to our house caused by kerosene heater. Soot covered everything. Restoration company came out and cleaned house. They mopped laminate floor with string mop and left to dry. Soot was still on floors and in seams. And seams started to swell. Insurance company had another cleaning crew come out to reclean the floors. They used a scrubby steamer and a scratchy pad to clean with. Now seams are really swelling. How do you prove if seams are swelling from excessive water on them and not coming from underneath the flooring. Diane, you ask a very good question. First of all if you have a laminate plank flooring with a particleboard type of core, your insurance company and/or it’s contractors owe you a new floor. These floors are not to be mopped, especially with a string mop and are not to be cleaned with a steamer. Both the string mop and the steamer are known to damage laminate floors and cause swelling. An expert flooring inspector can come to your house, perform testing including moisture testing and report if this is topical damage or damage from below. It sounds to me like the insurance company should hire an inspector to make these tests and report back to them. If the insurance company wants to save the expense of the inspector they should go ahead and replace the floor for the way you describe it this laminate flooring will need to be replaced as the swelling is not correctable. I forgot to ask how many times can a laminate floor be heavily cleaned before damaging a laminate floor and what would of been the correct way to get soot out of it. And Alaska does not have flooring inspectors. I’ve read your inquiries from those who have “cloudy”, “greasy”, “spotted”, “scratched” laminate flooring and thought I was the only one who had problems! My experts also said I used the wrong product but I used what was sold at the store I purchased the laminate from. However, it seems because we did not have them install the laminate they will not honor their guarantee on the product. Their expert came in and used “goof off” to try and clean the floor of its haze/cloudiness but nothing worked. They checked for moisture, too…not the problem. I complained to the sales person after it was installed and they were the ones to refer me to the “special cleaner” they sold. That’s all I used but it still looks bad. I’m still looking for some way to get the clear finish I was guaranteed! Any thoughts? We have laminate floors that have a gap between the boards. These gaps are by design, according to the manufacturer, Residential Design. We have followed instructions to use Bona for laminate floors as the cleaning product. However, within a month of moving into the house, I started to notice a fraying look on the edges of the boards. We called the manufacturer and they said it was consistent with exposure to moisture. KB Home said they had put a moisture barrier before the floor was installed. I believe the “gaps by design” are trapping the Bona product when we mop the floor and the moisture from bona is causing the fraying. I tested this by applying some bona to one of the undamaged edges, and within 20 minutes, the fraying was apparent. The damage is greatest in high traffic areas where we might clean multiple times. What is my recourse in this situation? If moisture is actually reacting that quickly and the flooring is that new, the dealer should have it checked out. I don’t know how much moisture it took to raise the edge. As inspectors we often have people telling us that the floor bubbles immediately. Only in a few of these situations are we able to replicate the concern. Usually we find that it takes an hour or longer while remaining wet. I just used the steam iron and damp cloth technique to try and lift a dent out of my laminate. It certainly worked only now I have a bump instead of a dent. Any ideas how to rectify this? People hear the term wood-laminate floor and often believe they can use the same techniques to remove dents from laminate that they can use to remove dents from wood. Wood and laminate are two different products and the only way you can remove a dent from laminate is to fill the dent as steam will usally damage a laminate floor. A typical laminate floor is made up of an hdf core, a pint layer similar to wallpaper and a protective coating which is usually melamine. Using a steam iron to remove a dent was more like using steam to remove wallpaper. The core was damaged and the print layer has probably released. At this point your correction is to live with it, remove the bump and fill it with a blending putty or replace the laminate plank. That makes sense. Had I thought about it a bit more I probably wouldn’t have done it, but the fact the technique appeared after I did a Google search for ‘how to get a dent out of laminate flooring’ I just tried it. Anyway thanks for you help and swift reply. I’ll remove the bump and putty fill it. First of all thank you both for this site. It is very helpful! My mother purchased Pergo Max from Lowes for a home that she will be moving into next year. She has Pergo laminate (that was installed about 20 years ago) in her current home and it has really held up well in a high traffic area of the kitchen. The new Pergo Max does not seem to be as durable. The day it was installed (by a Lowes installer) we carefully moved the refrigerator and afterwards noticed a (white) dent and scratch in the floor. The top layer seems paper thin with a thin coat of plastic. The planks have a small gap in between that the older flooring does not have. The new floor seems very fragile. My mother is 89 (very independent and lives on her own). I’m concerned that the floor may develop proud corners as I can already feel the slight difference in height between the planks even with proper installation. At some point she may need a motorized scooter and I’m not sure this floor is durable enough. I just wanted your opinion on Pergo Max. I have seen so many negative reviews online. The Pergo floor your mother installed 20 years ago was likely Pergo Original with glued seams. Personally I liked the glued seams as they remained tight and gave the flooring more protection against moisture. With Pergo Max gluing of the seams is optional and recommended when motorized chairs are used, which would include scooters. Pergo Max comes in a variety of patterns manufactured in 8mm, 10mm and 12mm thickness. If your mother has the 8mm thickness it is not going to perform as well as a 12mm laminate. One of the biggest problems we see with the seams, especially when the joints have the plastic inserts, is that the joints have not been properly locked into place. When not properly locked you can get a small gap and/or rise at the end joint. Sometimes the rise is on a single side of the end joint. This rise can also occur when one or more planks is locked in against a wall or other fixed object. Hope this helps and thank you for your nice comment. If yours mothers floor is a new installation and she is not happy with it, she should immediately contact the dealer she purchased it from. In my experience Pergo has been very good about arranging for a flooring inspector to check the floor out. Many laminate, engineered and prefinished hardwood floors will have edges that are not totally flush. When proud edges are noticed right out of the box. The standards of different manufacturers can differ significantly from about the thickness of a business card to the thickness of a dime coin. If an installer questions proud edges directly out of the box, it is advisable for the installer to contact the manufacturers technical department prior to proceeding for if it is excessive and installed, some manufacturers will no longer warrant the product for that condition. Even so, if you are still concerned, I would have your dealer contact the manufacturer and have the floor inspected. It is rare that proud edges becomes a danger but if they are really high they could, especially for those that already have difficulty getting around. After reading the comments above, I realized our almost-three-year-old Pergo laminate flooring is separating at the seams because our desk chair with plastic casters rolls over it. If we’d had any idea this would happen, we would never have had it installed in the first place. I kept all our original paperwork, but there’s nothing about casters in any of the paperwork. And I have gone through the steps to turn in a claim. Two Lowes’ customer service reps stated “it’s a topical moisture problem,” but there’s never been any liquid put or spilled on it, not even mop water. Now I need to know the best sealant or glue to use to repair the seams myself. Thank you for your help. Sorry, I cannot recommend a glue to repair the seams of your Pergo. My suggestion would be to replace the damage planks. If one of our readers has a glue suggestion perhaps they will share it with us. Thank you for addressing my problem. I’m afraid if we tried to replace the damaged planks, we wouldn’t be able to match the dye lot. And if we did replace the flooring, it would still be under the desk chair, and the same thing would probably happen all over again unless we replaced the plastic casters with rubber ones. Where can we buy rubber casters? I hope one of your readers has a suggestion. That would be great. We have had wood laminate flooring for several years. Last year, we had new kitchen cabinets installed. The carpenter did not measure correctly so there was a gap between the floor and the edge of one cabinet. My husband cut a piece from the extra flooring and had to force it into the gap. Within two weeks the gap was bigger. He again cut a piece to fill the gap and now within 2 weeks the gap is even bigger. HELP!! Sandy, you do not say how wide the gap is. You want to have a gap next to the cabinets so that your wood laminate flooring can expand when the moisture increased. The gap is covered with a quarter round or other trim. The gap should be at least the thickness of the flooring. If you are placing a wedge in this gap, you may be pushing the flooring towards the other direction. Check and see if this is what is going on. Great site. I am installing Armstrong Pryzm Floors (Waterproof Laminate with cork backer) on top of slab. I just finished about 1,00 sqft and I have a board in the middle of the room that has the wear layer/image layer peeling perfectly from the core. This is a week after the install. Is there anyway to adhere this to the core again or do I have to pull half the floor and replace the board? Board replacement would be the recommended method. Perhaps contact adhesive would work as a repair, though I have never tried it and am totally unsure of the result you may get. If any of our readers have a suggestion, please share it. I’ve had laminate flooring for four years and have had a wet patch under the gas fire ever since I’ve checked the chimney and it is sound. Wondering if drilling a hole round the side of the chimney breast out of sight might give a vent for the damp to dissipate?